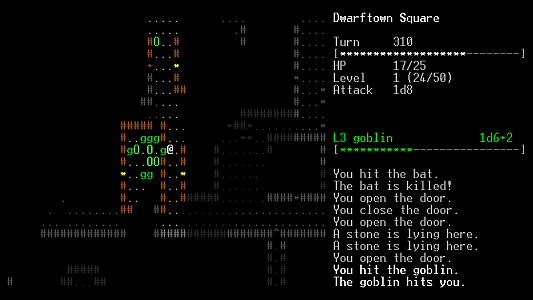 Dwarftown is a 2011 seven-day roguelike. It's a simple, traditional hack-and-slash, featuring no dwarves at all. It's written in Lua and libtcod. Version 1.0 (7DRL release) - includes source code; runs under Windows and Linux. Git repository - source code hosted on Github. To run, just execute the appropriate dwarftown-* script. 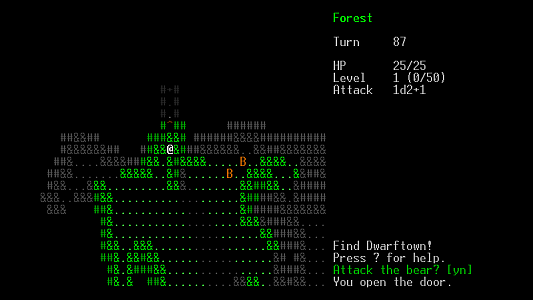 Madness, my other 7-day roguelike.